The president was seen golfing at the private Davie golf course where "Caddyshack" was filmed. 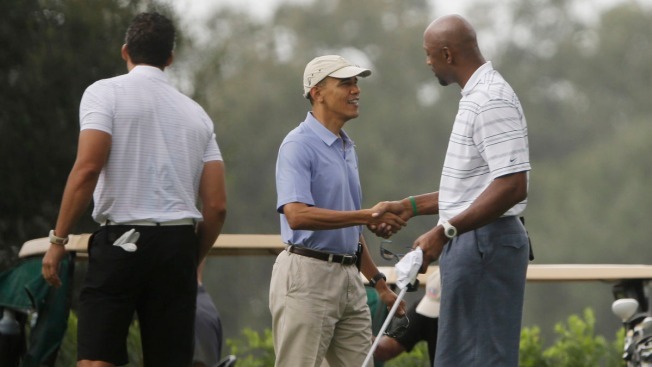 President Barack Obama, center, shakes hands with former NBA basketball player Alonzo Mourning, right, at Grande Oaks golf club, Saturday, Nov. 9, 2013 in Ft. Lauderdale, Fla. Obama traveled to the Miami area yesterday for a series of private Democratic fundraisers and a golf outing today. President Barack Obama made a stop at a famous Broward County golf course during this weekend's fundraising visit in South Florida. The president was seen arriving at the Grande Oaks Golf Club in Davie just before 11 a.m., reported NBC News. And he wasn't alone. The president was accompanied by former Miami Heat star Alonzo Mourning, as seen in the photo above. The 18-hole course is well-known for being the private golf club where the movie "Caddyshack" was filmed. Obama arrived at Miami International Airport Friday afternoon, causing some traffic delays in the area. Further road closures were expected Saturday. During a speech Friday at the Pinecrest home of Jorge Mas Santos and his wife Aleyda, Obama said the U.S. must continue updating its policies toward Cuba, saying the U.S. has started to see changes on the island. He said U.S. policy aims will remain the same, but the nation must find new tools to speak out. 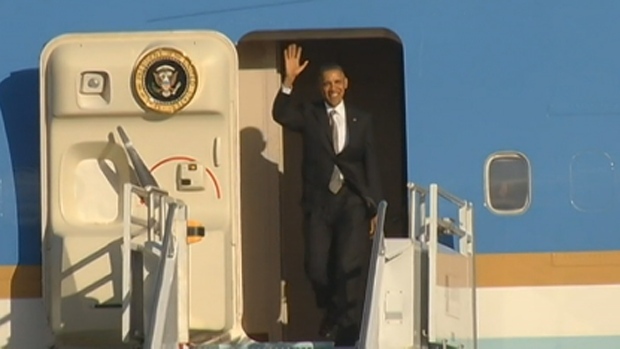 President Barack Obama arrived in Miami Friday afternoon for a fundraising visit that will last nearly 24 hours. NBC 6's Steve Litz has the story. The event was a fundraiser for the Democratic Senatorial Campaign Committee where the president planned to meet with Cuban dissident Guillermo Farinas, sources told Telemundo 51. The president's is scheduled to depart from MIA Saturday at 3:25 p.m.